In a sad side-note to the story of Franklin searches in the twentieth century, a significant number of artifacts collected from the Erebus Bay area were found in Barry Ranford's basement after his death in September of 1996 and that of his son in 2012. Ranford, who in many ways was responsible for re-invigorating public interest in Franklin in the early 1990's, had first walked the shores of King William in 1992; a year later, an archaelogical team led by Anne Keenleyside and Margaret Bertulli did a proper study of the site, and the bones which gave confirmation of Inuit accounts of cannibalism. Ranford, ever a maverick, didn't worry too much about archaelogical protocols, and had been known to pick up, and sometimes pocket, small items. These, along with some human remains he also collected, weren't known about until after his death, and until last week I'd had no idea what had become of them. Thankfully, his family did the right thing and brought them to the Canadian Museum of History, which then transferred them to the Nunavut collection, established when the territory came into being in 1999. As those following the story in the Nunatsiaq News and other sources will know, Nunavut has yet to secure full funding and make a final site selection for its own archival facility; in the interim, its collections are stored in two places: in Winnipeg (art) and at the Canadian Museum of Nature (archaeological materials). And it was at the latter's storage and conservation facility that, in the company of a fine fellowship of Franklinites, I was finally able to see these materials in person. They have been carefully preserved and tagged, but the location is given simply as NgLj-2, even though that's far from certain. Without a clearer sense of where precisely they were found, the story that these artifacts have to tell is incomplete, and subject to wide conjecture. Archaeology, in a deep sense, is about reconstucting a story -- so imagine if, say, instead of James Joyce's "The Dead," we had only a few scraps of manuscripts, a bit of typescript, and notes, none with page numbers or dates to show how the story evolved. It would be at best a ghost of a story. It's my understanding that Doug Stenton has been working on these materials in an effort to sort out what specific sites they are most likely from; I certainly wish him luck. But for now, simply seeing these relics was a powerful experience, a reminder of the fragility of human life and endeavor. 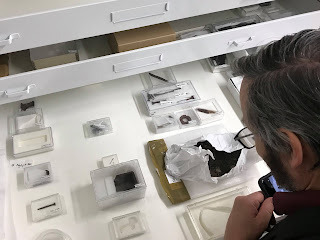 (With thanks to Scott Rufolo of the Museum of Nature for our behind-the-scenes tour, and to Alex Stubbing of GN Heritage for permission to share these images, and this story). Exactly right on ! Archaelogical protocol must be followed so that a complete story can be determined.